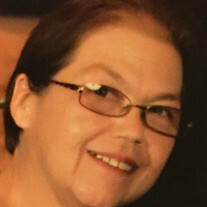 Becky Lynn Bowlin Shoun, 54, went home to be with the Lord on Friday, November 23, 2018. She was a faithful member of Deliverance Temple Church. Becky was preceded in death by her parents: Lois and Robert Bowlin, sisters: Brenda Bolden Brotherton and Mary Ann Bowlin. She is survived by her husband, Ray Shoun; daughters: Amanda (Grant) Kite and Danielle (David) Collins; sister: Judy Watts; brother: Larry Bowlin and grandchildren: Dawson, Sierra, Logan, Madison and Taylor; sister-in-law: Tami Roper ans several nieces and nephews. Visitation with her family will be Tuesday, November 27, 2018 from 6:00 PM until 8:00 PM at Mayes Mortuary. Funeral services will follow at 8:00 with Rev. Charlie Grooms and Rev. Aaron Grey officiating. Family and friends will gather at 10:00 AM, Wednesday, November 28, 2018 at the funeral home to proceed to Courtney Cemetery for an 11:00 graveside service.